Free Yeti cooler with qualifying rental! 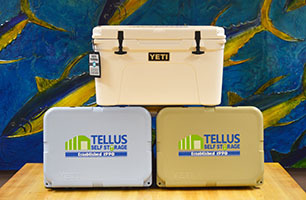 You can get a FREE YETI® cooler* from select Tellus Self Storage locations when you rent one of our fully enclosed boat and RV storage units! Our units have metered electricity and lots of room for your boat, RV/Camper, or – if you’re a construction company – tools and equipment. Our participating facilities have wide driveways, 24-hour gated access, and a call center standing by to help you 7 days a week!